I saw some crafted cupcakes and confections online made from felt or felted wool and topped with ribbons, buttons, and beads. They were really cute so I thought I'd try my hand at creating my own plush desserts. I have loads of fabric pieces, jars of old buttons, and ribbon remnants of all sorts. 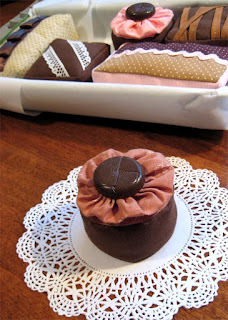 To use up these collections of scraps, I machine sewed all my confections using mostly cotton quilting fabric. 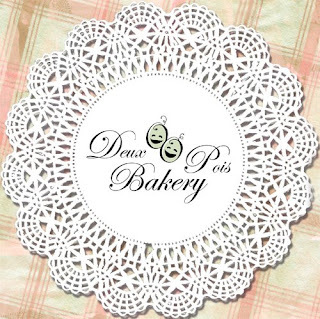 I created my own patterns and looks to stock my new "bakery", Deux Pois Bakery. The first batch of sewn confections is for a friend's daughter. She'll be turning two and getting a tea and kitchen set as gifts. The second batch, not shown here, is one I'm currently working on for my two girls. I have two more cakes to sew to complete the second set. Fun was had by moi! Don't they look scrumptious? If only they'd taste like they look...yummy! oh my! you are so creative. they look devine! you have such a way with scraps ~priceless and so priginal! You did a wonderful job. I'm so proud of you and all your creations. how amazing this is, what an unusual craft.